New York City’s tech industry is mostly white (62 percent) and male (60 percent), according to a recent analysis from the Center for an Urban Future. The fact that white men make up the majority of NYC’s tech force isn’t a huge surprise, but what’s interesting is how those figures compare to the diversity stats big tech firms like Apple, Amazon and Google have reported over the last year or so. The Center for an Urban Future analyzed tech employment in each of New York City’s five boroughs using the Federal Reserve Bank of New York’s new definition of tech employment, which is simply companies that “use technology as their core business.” More specifically, the tech sector includes seven industries: computer manufacturing, electronic shopping, software publishing, data processing and hosting, Internet publishing and broadcasting and web search portals, computer systems design and scientific R&D services. Most male employees in NYC tech work in software publishing (68 percent), computer systems design (66 percent), data processing and hosting (62 percent) and computer manufacturing (61 percent), according to the analysis. Meanwhile, the industries with the highest ratio of female employees are scientific R&D services (59 percent female), electronic shopping (48 percent) and Internet publishing and web search portals (44 percent). These diversity stats aren’t terrible. Having a 40 percent female workforce in New York tech is a step up from the 29 percent of women at major U.S. tech firms, which include Google, Facebook, Twitter, Microsoft, Apple, Amazon and Intel. But, in terms of race, NYC’s tech scene has more white employees (62 percent) than the tech companies mentioned above, which, on average, have a workforce that is 60 percent white. 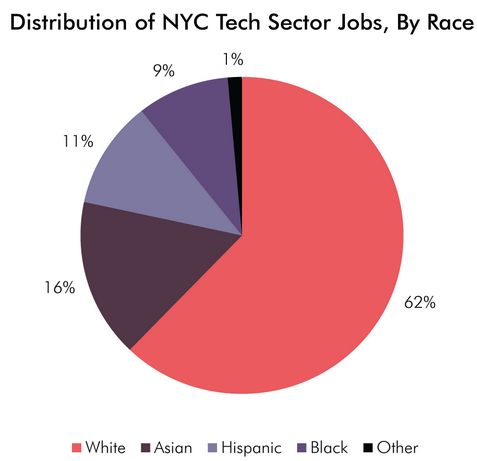 For the sake of comparison, NYC’s tech racial diversity data is pretty much in line with the U.S. Census, which reports that the U.S. population is 64 percent white, 16 percent Hispanic or Latino, 12 percent black, 4.6 percent Asian and 3 percent “other.” There’s more to the report than the distribution of gender and race in NYC’s tech industry, so feel free to check out the rest of the analysis here.